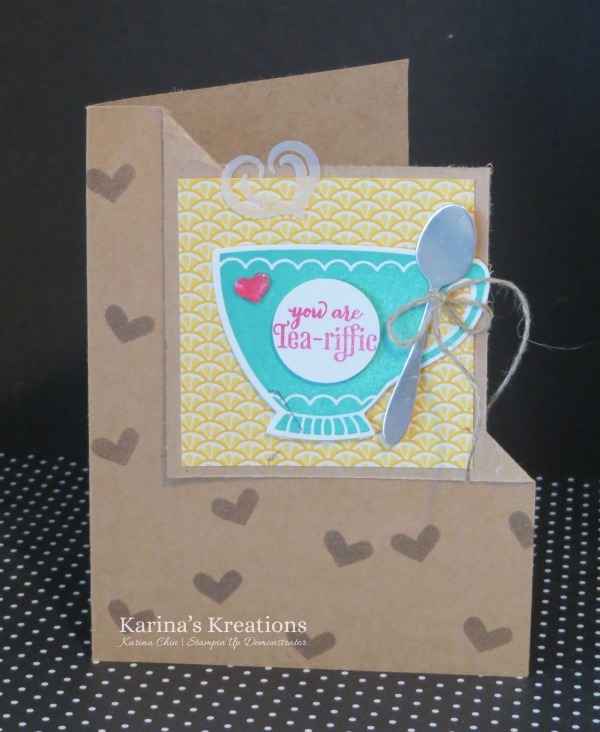 Karina's Kreations: A Nice Cuppa Corner Fold Card! A Nice Cuppa Corner Fold Card! I wanted to share a cute corner fold card with you today. I got this from my friend Brenda and I love how she used the Kraft Card stock #133674 as the base. My favorite part is the little spoon punched out of Silver Foil #132178. How cute is that? There is also steam cut out of Vellum card stock #101856. To make this card make sure to get the bundle that includes the Nice Cuppa stamp set and the Cups and Kettle Framelit Dies #141074. It's a super fun set!!! Imagine wowing your friends with all the cute cards you could make with it.